Bad News: We're not giving just anybody a dog. There is a screening process including an application, phone interview and home check. Good News: That means we're picky (both in the people who care for our dogs and the dogs themselves). 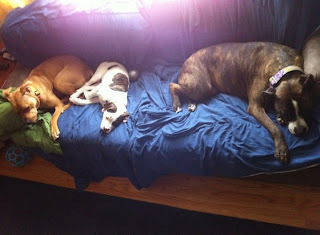 All dogs are temperament tested and vetting is done before (or arranged ASAP after taking on your foster dog). We take into consideration your work schedule, children and resident pets when choosing the place a foster dog in your home - and strive for a perfect match. Bad News: We're most likely not showing up with a well kept dog. He's probably going to smell like a shelter and will eventually need a bath once given a bit of time to settle. Good News: It's going to feel extra nice to cuddle him when he's clean and dry. 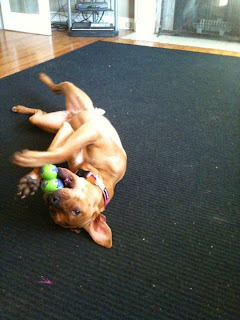 Bad News: Once your foster dog gets past the "honeymoon" period, he may display some habits that may not be desirable. Good News: An ADR rep will always be available to see you through these rough patches. We've been rescuing for years and have seen and heard it all (that wasn't a challenge...). A few of us have apprenticed with some super savy trainers and will work with you to overcome any training obstacles. 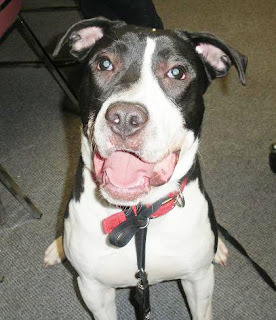 Bad News: After the mandatory 30 day holding period (which gives you and us time to learn the dogs personality), he will be posted for adoption, and eventually the perfect creature that you've work so hard training and have fallen in love with, will find the perfect forever home, and will leave your family for his own. Good News: You are welcome to be as involved as you'd like in the adoption processes. We will screen all potential adopters fully and since you know the dog best, will be able to give us your opinion and say on the dogs forever family. Can’t foster? That's okay, there are many other ways you can help! - Fundraisers (bake sales, etc.) Contact us for ADR materials. - Sources/pick up/deliver donated food. 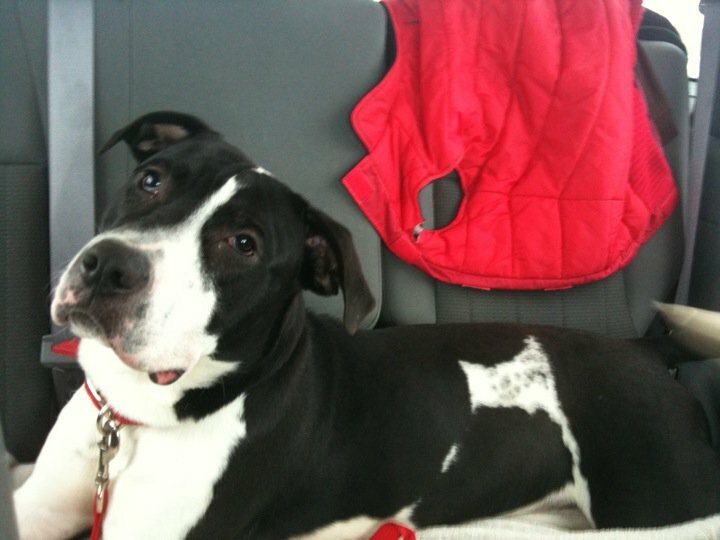 - Drive rescue dogs to vet appointments. 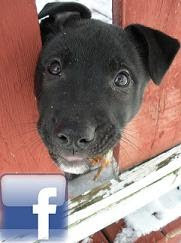 - Let us know if you are traveling from ON to NS and can take a pooch with you. Meet Moose! Or MoOoOoOse as we like to call him. Hes a BIG KID for an 8 month old pup, and had lots of love to give and smiles to share. Yes, this boy literally smiles. Not a huge fan of the cold (can you blame him with such a short coat), Moose does enjoy a good warm car ride, and will sit in the back seat like the gentleman in training that he is! Moose is wonderful with everyone he meets, but a typical over excited teenager when getting together with doggie friends (this will just take more time and exposure) but good none the less. He loves to walk around with his toys and show you his treasures, but will happily give them up for a cookie or three!!! Mind you, youd barely know you were feeding him because Moose has such a sweet soft mouth. He is a very special dog, and everyone involved in his rescue (including our vet staff) cant say enough good things about him! At approximately 1.5 years old, Nibbles found her way to ADR by way of a shelter that had to take her from her owner due to current Ontario laws (actually a blessing for her as his intent was to breed her and she was suffering from a tail injury). 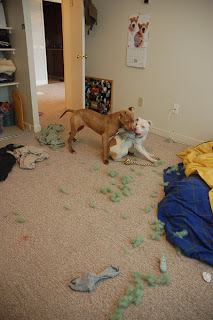 Prior to entering ADR’s foster care the shelter decided to have Nibbles’ “happy tail” (when the tail wags so much it whacks on everything and constantly splits open making a BIIIIG mess, and can be painful to the dog . . ) amputated. Unfortunately this procedure was done by a less than savvy vet and poor Nibbs had a bit of recovery ahead of her . . there was not enough tail taken away (so she has a rather large stubb) and not enough skin left to cover the bone. At this time the tail seems to have finally healed! But at no point did any of this even phase the sweet wiggly-Nibbly tempermant of this dog! Nibbs (as we affectionately call her) is currently in foster care with several adult dogs (male and female) and a young pup, and is the best of friends with EVERYONE!!! 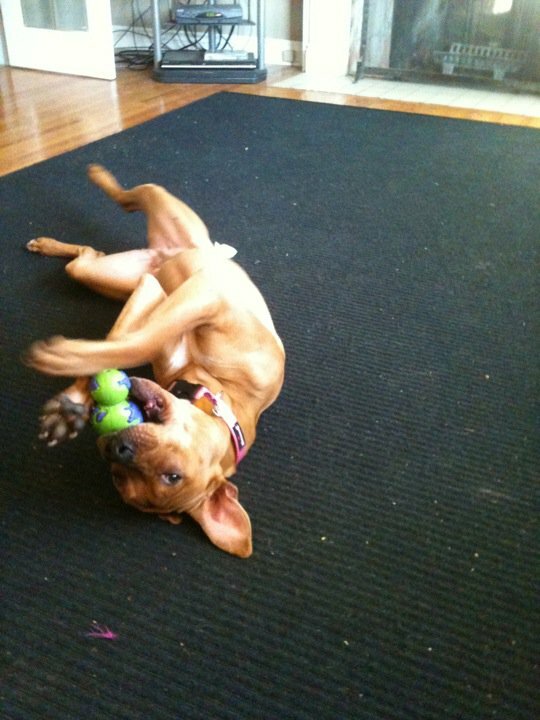 Toys, treats, bones, are all there to share and enjoy with her buddies! For this reason we would love Nibbs to go to a home with another doggie friend. That, and she is also a very high energy type pooch, so a friend to play and wrestle and run with would be idea! So either way, Nibbs is going to need an ACTIVE family, with an ACTIVE lifestyle. Nibbles is crate trained, and rides quite nicely in the car. Who wouldn’t love peeking in the rear view mirror and seeing those hilarious ears poking up out of your backseat?!!! To know her is to love her . . . so much so we had to talk her foster momma out of trying to keep her! We rescued our sweet smoosh faced girl Nelly following a surgery, performed by a clinic through the shelter she came from, for a lame back leg. This arrangement was made because the shelter understood that ADR could not afford to have this surgery done on the poor pooch. A couple months post-op, Nelly still was not using that leg. Upon further investigation, it was discovered the surgery was done incorrectly. As a result of not being used, her muscles went into atrophy. Despite the terrible pain, Nelly was still cuddles and kisses for all people (and pooches) she met. Funds were raised for corrective surgery and Nelly met with a trusted orthopedic surgeon, who, upon examining the leg, suggested we try physiotherapy before putting Nelly through another invasive (and costly) surgery. We were referred to Four Paws Canine Fitness and Rehab with Heather Kennedy (our saving grace), who set us up with a therapeutic exercise program which included electrical muscle stimulation and low level laser therapy. Within the first couple of weeks we were already seeing a noticeable difference and as the weeks went on Nelly became a completely different dog! As Nelly's foster mom, I am sad to see her go, but so very excited and happy that Nelly found a family just as special as she is. Make us proud little shadow! 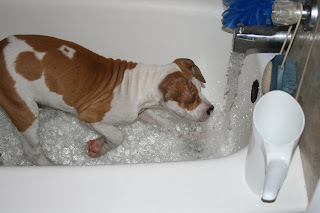 Welcome to the Ador-A-Bull Dog - Blog! Just another way for us to get the word out about ourselves and the fantastic dogs we have available for adoption. 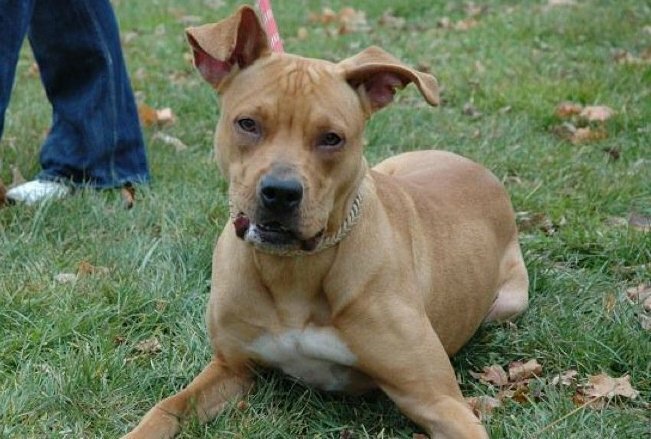 Check back often as we update with more information on our dogs, fostering, training, BSL, and all things concerning rescue and the pit bull breed.